When trading ships sailed along the ancient spice route centuries ago, merchants from far and wide landed upon the port of Galle in search of the fabled flavours of our exotic island. Tales of our spices reached distant shores, and drew hordes of travellers to our land – many of whom shared a wealth of culinary knowledge with our people, inspiring a wonderful combination of eastern and western tastes that are still prepared today. As one of our island’s most popular trading posts in history, Galle has naturally exposed itself to culinary influences from around the world – and this legacy has resonated among a multitude of unique palates at restaurants and hotels in the Galle Fort. At the Galle Heritage Villa by Jetwing, the historical flavours that landed in our resident neighborhood over the years have since been transformed into a delectable array of worldly meals that are sure to entice any traveller on earth. From global favourites to the freshest catch from our southern seas, we are delighted to serve you a delicious array of flavours at one of our many homes of Sri Lankan hospitality. 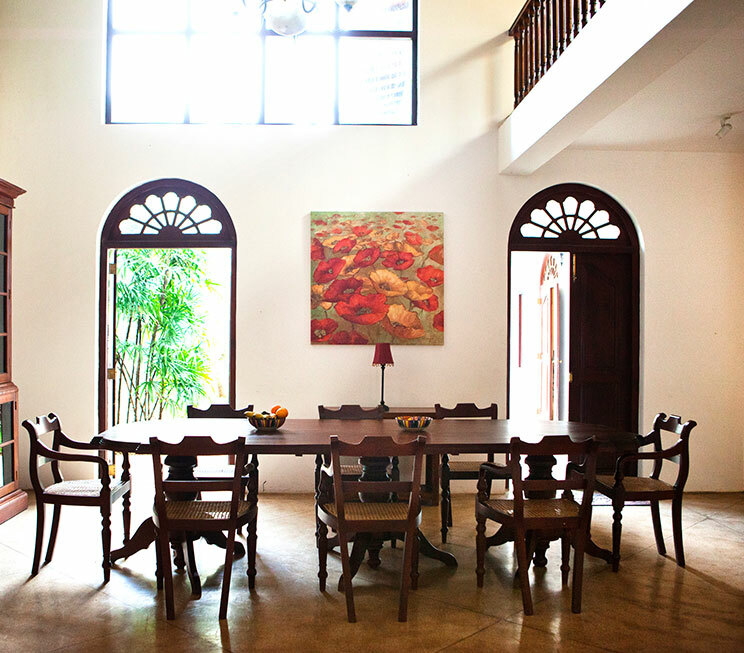 Here at the Galle Heritage Villa, we offer two intimate dining options for your comfort. Firstly, you may choose to savour legendary cuisines from our familial Dining Room – fitted with a robust vintage wooden dining table, and always adorned with a basket of tropical fruits at its center. Or, you may opt for a more personal experience – the specialty of our Signature Dining options. At your request, we will gladly arrange a dedicated space of our heritage home for you to indulge in a mouthwatering meal of your choice. Should you wish to dine at a more open setting, our family of restaurants at the nearby Jetwing Lighthouse is always ready to serve you with the finest of Sri Lankan hospitality. Dine on an elegant antique table at the heart of our 17th century home.